I know not everyone is a fan of fruitcake but in this house we love it! I think it depends on what you have grown up with. I vividly remember my mum making a Christmas cake every year - the ritual of lining the tin with layers of brown paper, the special big bowl that was only ever used at Christmas time and licking the sweet and spicy leftovers from the spatula. If you've spent any time here you will know that we eat low sugar these and this cake definitely does NOT fall into that category. But this is one of our special Christmas traditions and I hope my boys have similar fond memories to me. I have been making my Christmas cake from the same recipe for at least the past 8 years and it is tried and true. I make one for my Dad every year and have been asked to make one for friends of his as well which is a good indication just how good this cake is! 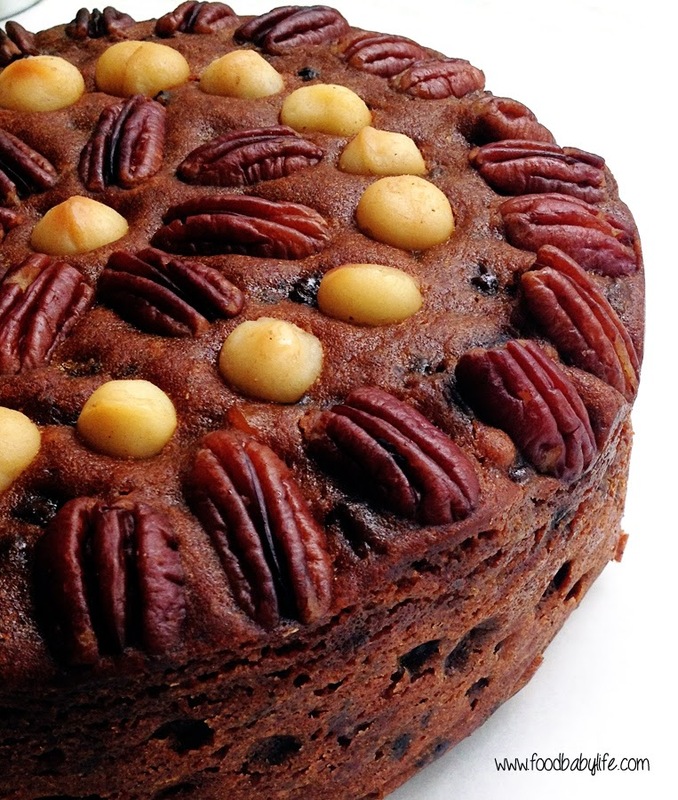 It is a traditional boiled fruitcake laced with brandy and beautiful fragrant spices. I usually try to put the fruit on to steep with brandy in November but I was a few weeks late this year. The fruit soaked for only 3 days and will have only 3 weeks to mature before Christmas. Like most fruitcakes it gets better with age so the earlier you can make it the better, although it would still be absolutely fantastic straight from the oven. If you've never made your own Christmas cake before I encourage you to give this one a go. Combine the dried fruit and brandy in a large bowl, cover with plastic wrap and leave to soak overnight or for a week or more. Line the base and sides of a deep 23cm round or 19cm square baking tin with 2 layers of brown paper and 2 layers of baking paper, bringing the paper 5cm above the edge of the tin. In a large saucepan, place the soaked fruit, butter, water, sugars and bicarb soda and bring to the boil over medium heat. Once boiling, give it a good stir, remove from the heat and allow to cool completely. Preheat the oven to 140 degrees Celsius / 120 degrees fan-forced. Stir the eggs into the fruit mixture the fold through the sifted flours and spices. Pour into the prepared tin and smooth the top. Decorate the top with the pecans and macadamias. Bake for 3 hours. Brush the hot cake with extra brandy. Cover the cake with a layer of baking paper then a layer of foil. Wrap the whole tin in a towel and leave to cool completely (overnight is good). Once cool, remove all the wrappings, brush the cake with extra brandy and re-wrap with fresh baking paper and foil and leave in a cool, dark place for at least a few weeks if you can before serving. Christmas just wouldn't be Christmas to me without a good fruit cake. Yes, the making of the cake was a tradition in our house too when I was growing up, and I used to love getting a chance to give it a stir and especially to lick the bowl. This is a beautiful looking cake, and I'm quite impressed that you make the same one every year, making your own tradition - I tend to try a different recipe every year!